Alrighty my friends! I hope you ate your Wheaties this morning! Today is the day you get to vote for your favorite jingle! You’ve got two big decisions ahead of you, so I won’t waste your time with a long intro. Just go through the entries below, and after you’ve viewed them all, choose your favorite and vote! Feel free to have your friends and relations visit and vote too. You will have until Thursday May 16 at noon EDT to cast your vote, and I will announce the winner on Friday after Perfect Picture Books. The prizes (if you need a refresher) can be viewed HERE. Oh and BTW, I’m sorry I couldn’t get all the entires to load right here. I tried. But you know me and technology. So I apologize if you have to click. They should at least all open in separate windows or tabs! Ava Ava needs some sleep. Ava Ava counts some sheep. Count some pigs and cows instead. Much too noisy for my bed! Cannot sleep without my sheep. So get a copy NOW! Leader: What do you do when you cannot sleep? Group: Call for sheep! Call for sheep! Leader: What will you do when they jump the gate? Group: Count and wait! Count and wait! Leader: What are you waiting for? Leader: What kind of sleep? Leader: What will you do when the sheep wear out? Group: Um’s and uh’s and shoulder shrugs. Leader: Sounds like you guys need a back up plan. 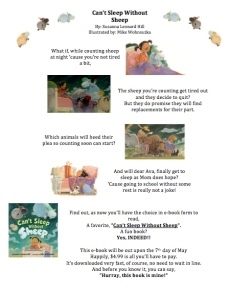 Read Susanna Hill’s E-Book “Can’t Sleep Without Sheep” to find out what happens after the sheep get tired. Go HERE to hear Delores sing it! please don’t turn out the light. without him by my side. and gazed upon his herd. to stand by Ava’s side. their bleating rose on high. as round her bed they’d fly. and every thing’s all right. have come to save the night. Or go HERE and click on the link in her post if the above doesn’t work! #8 Catherine – go HERE to see her video if it doesn’t come up below! #9 Penny – Go HERE to see her video! #1 Josie – please click HERE to see her 2 drawings. #3 Rylee – please click HERE and scroll past Catherine’s video and Matthew’s drawing to the BOTTOM drawing. As with the jingle poll, please cast your vote for the kids’ contest winner by Thursday May 16 at noon EDT. Thank you all for being such good sports about entering and about voting! Especially since, after all this, the e-book is still not available! But we had fun anyway! Looking forward to seeing who the winners will be!!! Please spread the word to anyone you think would like to vote! I plan on going through all these entries during the day to be able to cast my vote. Bravo to all this amazing talent! Wooo! *hops over fence* I can't wait! May the best jingle win! *clops towards the sunset* Yee-BAH Wooliam! I can't believe how many there are! I had an inkling but now when they are all together on your web site like that it's so impressive. It's going to be hard to pick just one. I'll have to go through this later on when I have more time to think. How fun, Susanna! Wooliam and Ava should be very excited over all of this sheepla!!! You're making me think I need to write a story where Woolliam is a cowboy, Erik 🙂 I can't wait to see who the popular vote will choose! Ha! I had down hoopla…but then I heard a distant baaaing in my brain and voila! Sheepla was born. Wild and Wooly Sheepla just for ewe! Wow, all these choices made it really tough to pick a winner. Kudos to everyone! Tough choice – I easily eliminated myself – but that left toooo many great ones!! I finally decided. And I when you do have a release date I'm willing to either post the winner on my blog or at the very least repost mine. Anything to help you promote. Great stuff here. Congrats to all those who submitted. Aah! I was going to make it the other day but then you posted such a beautiful sheep cake, how could I beat that?! In the end, I just had to vote for . . . (seriously? you thought I would tell? that would be baa-ad for morale). Those videos have me in stitches…but, really, ladies and one gent, I'm laughing WITH you, not at you. ;D Voted! And I have applause for everyone who entered this contest. It's not for the faint of heart or soft of voice. LOL! Enjoyed listening and reading all of the jingles. Love the contest for kids too. Cast my votes. Loved your jingle to the Beverly Hillbillies. Everyone was so creative! I have voted, but it was really hard to choose. So many great submissions! Woolliam thinks he'll jest mosey on down to the baa-arn with his spurs that go jingle jangle jingle 🙂 “Git along, little lambies, git aloooonnggg…..” – golly, now you've encouraged him to sing! Glad you enjoyed them, Pat, and thanks so much for voting! Everyone was really just amazing! In answer to your question on my blog: Yes, I've read Stolen. And yes, I couldn't stop thinking about it either. Thanks for voting! And no thanks for the fact that I now have Forbidden waiting for me on my kindle, tempting me away form work! 🙂 Wasn't Stolen amazing? I found myself wanting them to get together somehow, even though it was just all wrong on so many levels! That is good writing! It was so much fun viewing the videos and drawings. What a fun contest! Voted! There is some really great talent in our community! What a brilliant idea. It was super hard deciding on both the words and art. I eventually went with Mathew's drawing cause it looked like a ghost which I thought was clever, but whatever it was it was cool!! Now if only I had an iPad.